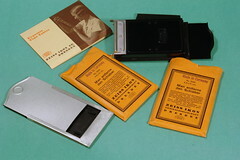 The Ermanox, first introduced in 1924 under the name Ernox, is a camera for 4.5x6 cm plates, made by Ernemann in Dresden. 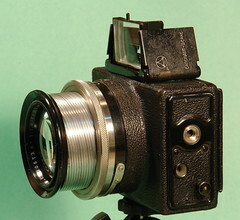 The camera has a huge and unusually fast Ernostar 85 mm f/1.8 lens (examples are also seen with a 100 mm f/2 Ernostar). It has a focal-plane shutter, with speeds 1/20 - 1/1000 second, plus 'B' and 'T'. Whether or not it was introduced as ERNOX is still under debate, none of the Ernemann catalogues support this name. The unusually large aperture made available light photography a real possibility. It was this feature that made the camera famous, especially in the hands of Dr. Erich Salomon (1886-1944), who used it to make candids. 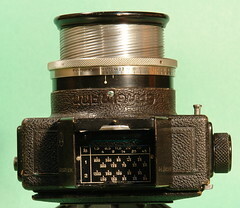 The first version of the camera has a rigid metal body (covered with black leather); the second version is a strut-folding camera. 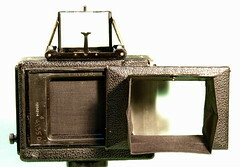 Both of these have the folding Newton viewfinder as shown here. 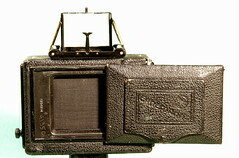 A ground-glass focusing screen can also be used (one of the examples of the camera seen at Westlicht was sold with a screen, though the listing does not show a picture of it). 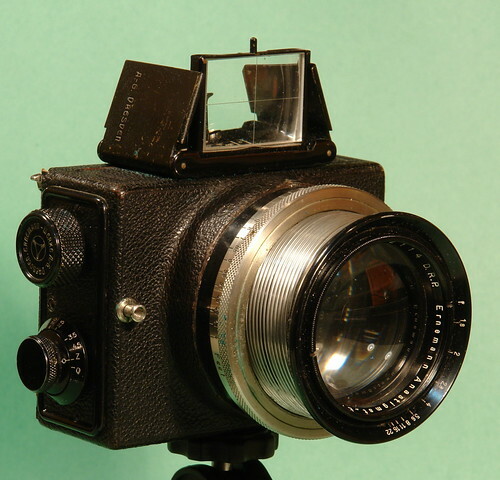 There is also an SLR model, the Ermanox Reflex, which has a focusing screen on the top, with a folding leather hood. A strut-folding Ermanox made for 9x12 cm plates, and in tropical materials (uncovered mahogany with brass fittings and brown leather bellows) has been seen at Westlicht; the notes suggest this camera may be unique (i.e. presumably made to a special order). It has a 16.5 cm f/1.8 Ernostar. 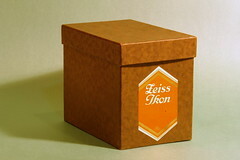 Other 9x12 cm with a 16.5 cm Ernostar exist and are in private collections. ↑ Strut-folding, tropical 9x12 cm Ermanox serial number 1053977, with 16.5 cm f/1.8 Ernostar lens, and with matching plate holders, filmpack holder and focusing screen, sold (for 38400 Euro) at the 24th Westlicht Photographica Auction, on 23 November 2013. An Ermanox at the George Eastman house. 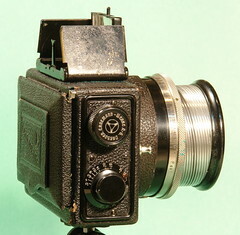 Ermanox with 10 cm f/2 Ernostar, sold in the 20th Westlicht Photographica Auction, on 1 November 2011: good pictures of the camera and lens. 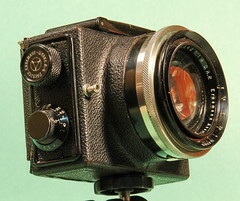 Ermanox Reflex with 10.5 cm f/1.8 Ernostar, made for Ernemann by Carl Zeiss Jena, also sold at the November 2011 Westlicht auction. Dr. Erich Solomon, a photographer using the Ermanox, at German Wikipedia. Article in German. This page was last edited on 28 August 2018, at 10:38.